2017 has been a very busy and exciting year with being invited to two exhibitions in London, one being the London Art Biennale held at the Chelsea Town Hall in March and the other the “Royal Art Prize” held in the Royal Arcade gallery Pall Mall London during April and May. ​Toward the end of May I was in a group show for the W.A Club “Art at the Top”. Apart from traveling in Europe extensively for two months, I have been preparing work for a solo exhibition at the Turner Galleries in one of the Engine rooms opening on the 27th April 2018. I am very excited about this as it will be my first solo exhibition at Turner. ​I also will be featured with other artists in a book titled “Artists of Perth” which will be launched in December. Graham converted a half tonne of Les Blakebrough’s Southern Ice porcelain paper clay by Clayworks into a sculpture which was generously fired by the ECU School of Education, St Stephens Secondary School, and at the studio. Many local potters, studio artists and volunteers kindly gave of their time to applied decals / transfers and packed it. A further 57 generous donors enabled Graham to ​receive funds from Creative Partnerships Australia through the Australian Cultural Fund, and and a fundraising preview studio party. The 2.5m high sculpture was installed in Personal Structures - open borders, an exhibition at Palazzo Bembo, within the context of the 2017 Venice Biennale, Italy. Workshops were held at Hale School, for the City of Wanneroo and a talk to the Sculpture Network, in Venice. US Workshops are likely in 2018. Studio classes continue in 2018. ​2017 was a full and exciting year. I have continued landscape painting and making my sculptures, some of which have been retailed in Claremont. 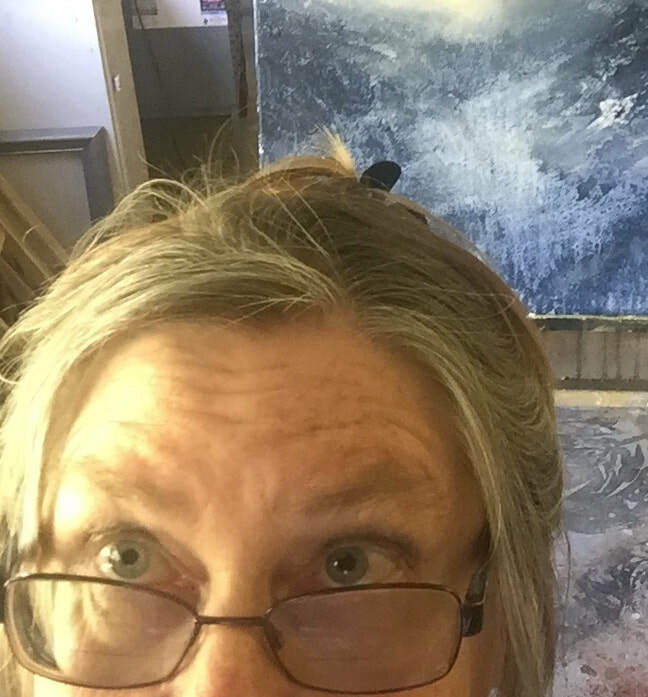 I have exhibited paintings both in the studio on open days and at the Wanneroo Art Award. Most exciting of all I won an international art competition run by the International Confederation of Art Critics (ICAC) in London. The prize was the exhibition of two paintings in Chianciano Terme in Tuscany Italy at the Expo Chianciano. My plans never change and thus plans for 2018 are simply to keep on keeping on making. 2017 was the first time in 5 years that I decided not to hold a solo exhibition and although I was involved in several group shows, it gave me the opportunity to consolidate, experiment a little and move into some slightly different areas with my art. The year began with a trip to Italy and France – always places of inspiration for me. I came back wanting to put energy into figurative works, particularly painting. It had been many years since I had painted the human form and so I used the traditional glaze building techniques that I had been working with for many years, to work on figures. Some of the works can be seen on my website and Facebook page. Our two Open Studio days were wonderful; I always enjoy selling my works and meeting new people and fellow artists. Another highlight was being included in the Artists of Perth book, due out in late December. This year once again has been steadily productive. My Grateful Book was self published by the author and has now been snapped up by a Perth publisher and Sarah has also adapted the illustrations for a Maori edition of the book. Sarah is currently working on the second book in the series due to be published in 2018. This year also saw the beginning of Little Smart Arts, an after school art class which Sarah runs in the northern suburbs close to her children’s school. Due to the reduced amount of art and creating in current primary school curriculum Sarah saw the need for this classes and is looking to expand them in the new year. 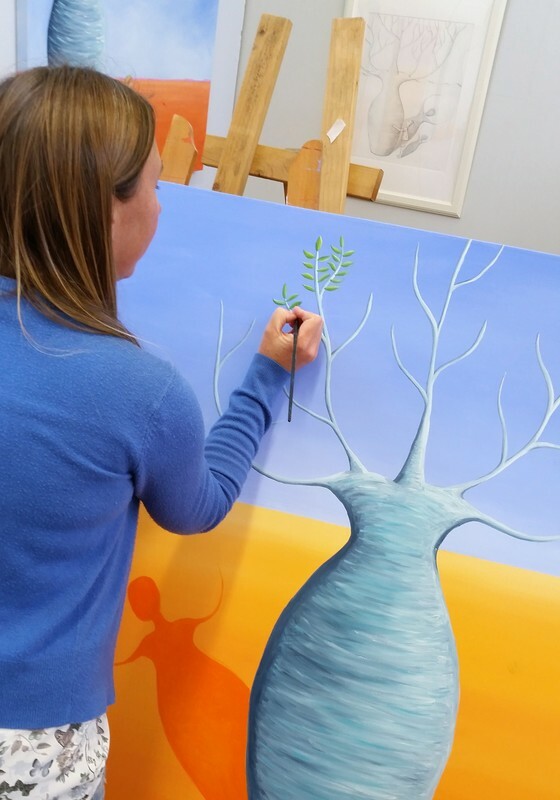 Her adult acrylic painting classes continue to remain popular in addition Sarah was approached by Breast Cancer Awareness to run workshops for ladies battling secondary breast cancer. The first workshop proved a huge success and more are planned before the end of the year and beyond. 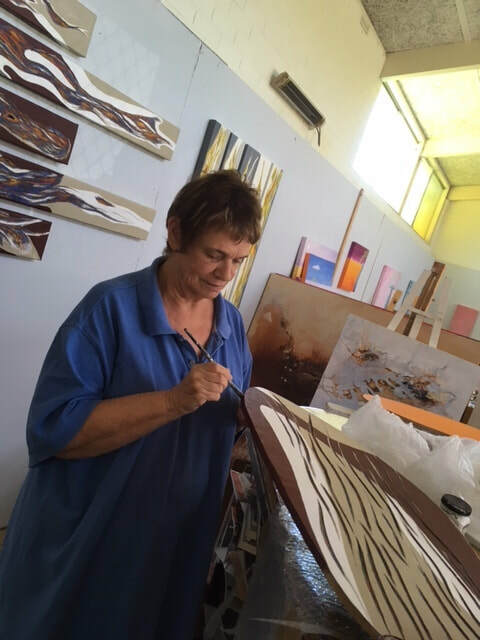 With regards to her personal work the later part of 2017 focused on completing her largest commission to date as well as being invited to participate in RAW Artists Showcase with forty other Perth creatives and over 400 visitors to the one night event. Next year Sarah hopes to focus more on building up a body of work for a possible solo in the future and working on her own children’s book. 2017 sure has rung the changes in my practice! After wrapping up teaching at North Metro Tafe in 2016 with the intention of dedicating some time to Linton Silver and focussing more fully on my own work, I went on the hunt for a city base and made contact with the lovely folk at Robertson Park. One thing led to another and I gladly established my studio there in March of this year. The space has met my needs well and I have been thrilled to also meet a new group of of passionate, talented and supportive friends in the artists I share the space with. Since I joined the studio we have taken part in a joint open studio and Perth Open House at the premises; both successful collaborative efforts. Over the course of the year I have had the pleasure of working on many commission pieces including engagement rings, remodelling of heirloom jewellery pieces, some custom designed hollow ware and a vast amount of Linton Silver cutlery and tableware. I also developed a new line of production jewellery pieces now stocked with three local galleries and started an online shop. I discoursed on the future of the art jewellery sector at Laurence Wilson Gallery (despite my healthy fear of speaking in public) and I created work for a curated group exhibition in Melbourne, which is to show at Bunbury Regional Gallery and Ellenbrook Gallery in 2018. I'm excited for the 2018, having commit to a solo exhibition for late in the year I have now begun working on a new series incorporated the wildlife art of Peter Slater from his 1978 publication 'rare and vanishing australian birds' which has me hooked; I'll look forward to sharing the results with you all. On the afternoon of Sunday 2 April interested locals, studio and other artists, crowd funders and volunteers contributed food and drink for an informal and only Perth viewing of Graham Hay's "Critical Mass" sculpture before it was shipped to exhibit during the Venice exhibtion. Our annual Open Studio was held on Sunday 11 June for many appreciative visitors. We also opened the studio to a steady stream of visitors for over the weekend of 11-12 November for the 2017 Perth Open House weekend. Started in the UK in 1992, it's now a world-wide phenomenon in over 30 cities. This was the first time we participated in the Perth event. Studio artist Chris McClelland and long time student Paul Aldred were selected to exhibit in the 2017 Claremont Annual Art Award and Exhibition. Again in the news: Paul's fourth book: The Golden Man, which he also illustrated, was launched at the studio on Friday 6th April. In addition to dozens of local, interstate and international artists and visitors to the studio: we were visited by Indian artist Anjani Khanna and Czech Republic artist Vladimir Uhlik, as well as members of the informal Zappa Sculptors Group. The studio is a socially dynamic making space. Sign up now for this annual newsletter. Visit our Facebook page and "Like" us, for more frequent news, images and details.